Join local teacher, Eva Eicchorn and retreat organizer, Marcel Vosloo for 10 days of yoga and adventure visiting Namibia’s top 3 locations. We will visit Namibia’s Greatest Wildlife Park for incredible game viewing experience & explore the German influenced coastal town where the Ocean meets the Desert. Meditate in the stillness of the oldest Desert in the World, ending the retreat with luxury accommodation the night before departing, it certainly can’t end on a more relaxed note. Explore and discover some of the most spectacular LOCATIONs in NAMIBIA WITH EVA & MARCEL, whilst also focusing on your yoga practice in the beautiful natural surrounds. Etosha Village uniquely delivers the perfect safari style experience in a private and protected reserve directly adjacent to the Etosha National Park. 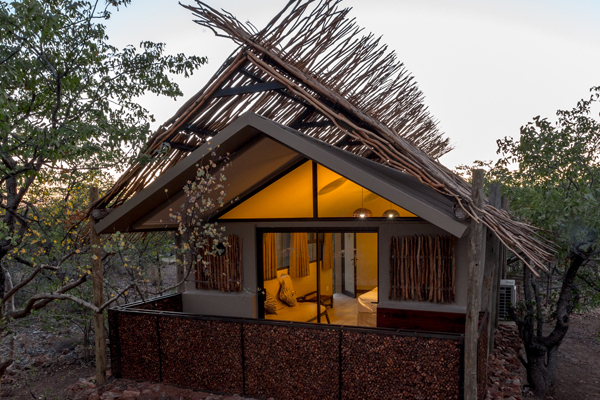 At Etosha Village nature and luxury are in perfect harmony through design and comfort. Besides the 45 accommodation units and camping facilities, Etosha Village has three restaurant seating areas, a sparkling pool plus two smaller pools as well as a well-stocked curio shop and of coarse…the outdoor yoga deck! ETOSHA NATIONAL PARK IS HOME TO 114 SPECIES OF MAMMALS, 340 BIRD SPECIES, 110 REPTILE SPECIES AND 16 AMPHIBIAN SPECIES WHICH MAKE GAME VIEWING IN ETOSHA A UNIQUE EXPERIENCE. The individual luxurious units offer a spacious air-conditioned bedroom and a modern en-suite bathroom with shower. The patio and outside seating area create an ideal space to sit back, relax and enjoy the beauty that surrounds you. Desert Breeze offers the ultimate desert experience. A short drive from central Swakopmund, its spectacular location provides peace and tranquility away from the bustling town, and the privilege of savoring the ancient Namib Desert. Surrounded by the colorful and unique architecture contrasting but yet fitting in with the desert landscape, it will sooth any soul. The luxury bungalows with their creative atmosphere and the friendly staff will make your stay one to remember. Breakfast will be at Desert Breeze, lunch and dinner at one of Swakopmund's many cafes’s and restaurants. Swakopmund is a coastal town facing the Atlantic Ocean. It has a laid back feel to it with palm trees, good restaurants and gift shops. For the more adventurous, there are a variety of extreme sports, from skydiving, quad biking, fat wheel biking, ocean safaris, dune boarding and surfing. Desert Quiver Camp uniquely combines comfort and style. Conveniently located a mere 5km from the entrance gate to Sossusvlei. the inspiring scenery characterized by granite outcrops, spectacular views and roaming wildlife will captivate your senses. The accommodation units have spacious twin-bedded room, en-suite bathrooms, and patio. Facilities at the main building include a fully stocked bar with a big screen television, a sparkling swimming pool and 2 communal boma-areas. Meals will be enjoyed at the nearby Sossusvlei Lodge restaurant and their Adventure Centre offers a range of exciting desert activities to explore the area. Situated a mere 29 kilometres south east from Windhoek on a hilltop overlooking a spectacular landscape, Gocheganas is a luxury lodge offering a unique combination of Wildlife, Nature and Wellness experiences. With 25 different wildlife species located on a 6000 hectare Nature Reserve, game drives and walking activities are welcomed as an enriching experience. The architecture and decor of all buildings at GocheGanas incorporates local arts and crafts in celebration of the culture of Namibia. Offering 16 totally private chalets under thatched roof with uninterrupted and spectacular views over the surrounding Reserve. The Wellness Village boasts a top of the range selection of wellness treatments, products and services. Other facilities include eleven treatment rooms with state of the art equipment such as a crystal bath, hydrotherapy bath, a vichy shower etc, as well as a heated indoor pool, a cave sauna in a cathedral like masonry vault, a well-equipped fitness gym, fruit and juice bar, thus making a visit to GocheGanas Wellness Village a unique experience. TO REGISTER FOR THIS ADVENTURE, YOU CAN EITHER CLICK ON THE WETRAVEL LINK OR FILL IN YOUR DETAILS BELOW. WeTravel, a secure online payment platform for your travels. We offer payment plans for both options. Looking forward sharing our 10 Day Yoga Safari Adventure with you. Love and Sunshine out of Namibia. AN UNFORGETTABLE JOURNEY THAT WILL CAPTIVATE YOUR SOUL, MAKING YOU FEEL MORE PEACEFUL & BALANCED.